Dr. Taneja did her General Neurology residency at UT Southwestern. 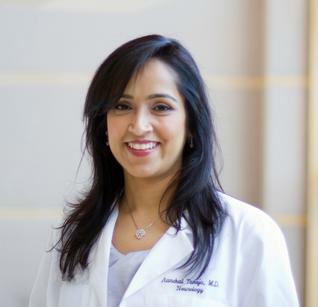 She is fellowship trained in Movement Disorders and Parkinson's Disease from the University of Texas Southwestern Medical Center at Dallas, with a special focus on Deep Brain Stimulation (DBS) programming. Dr. Taneja is also fellowship trained in Clinical Neurophysiology and Neuromuscular Disorders, which gives her an edge in Botulinum toxin injections as a treatment for various movement disorders. Her clinical research interests include cognitive decline in patients with Parkinson's Disease and DBS as effective management for some movement disorders. Dr. Taneja has delivered presentations at national and international conferences for which she has received awards and travel grant. She is a member of the American Academy of Neurology and Movement Disorders Society. Dr. Taneja is dedicated to providing compassionate, patient-centered care for individuals with movement disorders and believes in building a long term relationship of caring and trust. She has one daughter and enjoys spending time with her. D Magazine's Best Doctors in Dallas for 2014, 2015, and 2016.